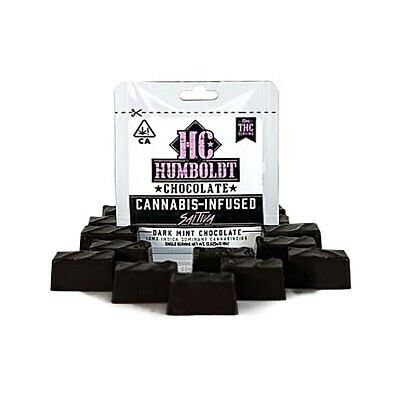 Humboldt Chocolate’s Saltiva Bites are a delicious Dark Chocolate combined with Coarse Sea Salt and 10mg of THC from a Humboldt grown, Sativa dominant cannabis strain. Saltiva Bites are great for day time use. You’ll enjoy relaxing physical effects that may ease your aches and pains, combined with a cerebral high that won’t make you sleepy. We use only high quality, simple ingredients and source local products whenever possible. Our chocolate is non-GMO and our bars are all natural with no preservatives. They just taste so good that you’ll want to eat em all!